We are delighted to announce that we have been featured in a publication honouring the highest levels of achievement within the Muslim community. 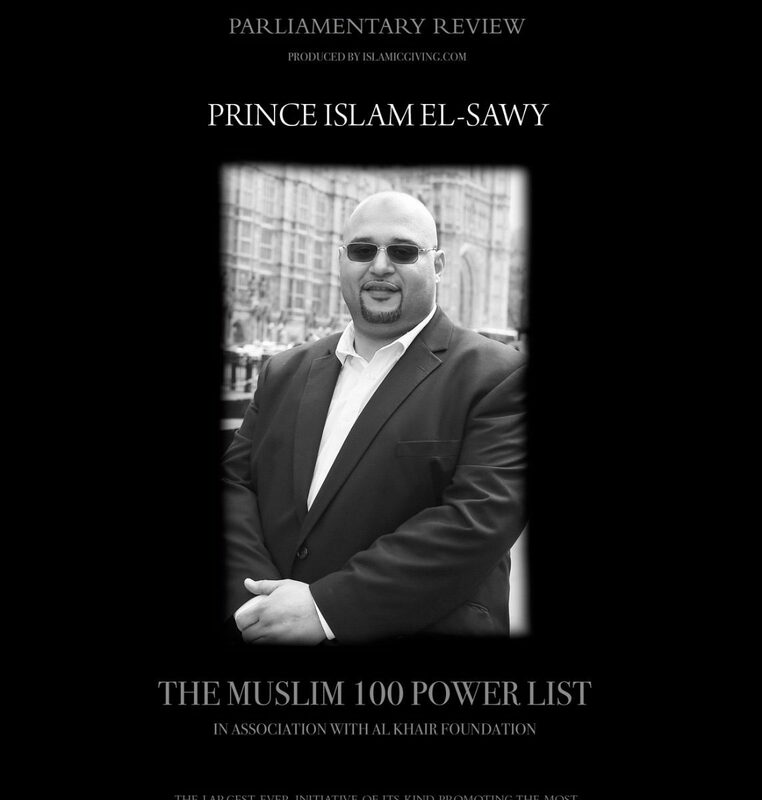 Prince Islam El-sawy, has been included in the Trailblazers category of “The Muslim 100 Parliamentary Review Power List”. The final Muslim 100 Parliamentary Review publication was launched at the star-studded gala awards dinner at the Hilton Park Lane London on the 7 May 2018. This edition of the Muslim 100 Parliamentary Review was produced by the British Publishing Company. The Muslim 100 names will include British based Muslim Powerbrokers and the Global Muslim men and women of influence from many Muslim countries including Indonesia, Pakistan, India, Bangladesh, Turkey, Saudi Arabia, UAE, Jordan, Palestine, Malaysia etc. Previous notable entries include, former Harrods owner Mohamed Al-Fayed, singer Yusuf Islam (formally Cat Stevens), broadcaster Rageh Omaar, politicians Baroness Pola Uddin, London Mayor Sadiq Khan, Shahid Malik MP, and former secretary general of the Muslim Council of Britain (MCB) Sir Iqbal Sacranie, Metropolitan Police assistant commissioner Tarique Ghaffur and Labour peer Lord Adam Patel of Blackburn. “I am absolutely delighted to have made the list amongst notable influencers & industry leaders. I feel privileged and honoured to be recognised for my work. This has given me further encouragement to do more and make positive impact to the lives of others ”. Prince Islam El-Sawy is a partner in the family run business El-Sawy Travel, the first Tour Operator from the UK offering Hajj and Umrah packages to Saudi Arabia. He is passionate about his work, where he has directed the company to receiving constant praise from their customers to winning awards and featuring in international media. He has also been instrumental in bringing much needed reforms to the Hajj and Umrah industry by being involved in the founding of an industry body to improve standards. Prince Islam has been very willing to share his vast knowledge of the Hajj and Umrah industry and his experience from leading his company in a number of other fields too, including working with and advising a number of national charities on innovative ways to enhance their work and increase their attraction to both members of the public and potential donors. Having a diverse network of friends and clients, he has also been at the forefront in advising foreign investors entering the UK market, by accompanying them to their meetings in the UK. His knowledge and bilingual skills have earned the trust of key individuals from abroad. All this is in addition to his input in creating bespoke IT systems to help individuals and companies to improve their working environment. A true innovator and leading light in the British Muslim community. We wish him the very best of success.